100 squares x 100 squares. It can be made with your normal knitting worsted and an H hook using single crochet stitch. For a longer afghan sized piece, use the extended double crochet(edc). Hope you enjoy this pattern as I had fun designing it! 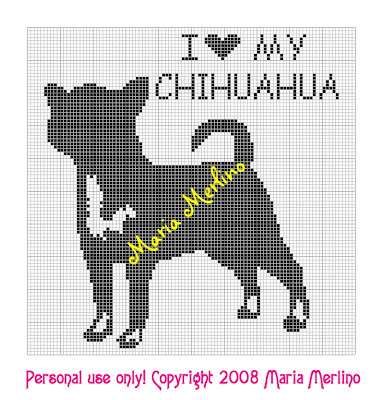 Your Chihuahua Items are just waiting for you! I sincerely hope you enjoy this pattern but please don't violate my copyright. Do not sell or or profit by my work.